Ted Nugent said on Twitter: "I cry tears of blood for The Last Best Place & the warriors who died for this tragedy." The election of President Barack Obama to a second term Tuesday night had many cheering in the streets, and the Twitterverse alight with commentary (and his most-ever-retweeted photo, once he posted a picture of himself hugging wife Michelle). But not everybody was so happy. In fact, some were downright furious. Donald Trump may have been the most outraged, releasing a stream of Tweets that ran the gamut from calling for a revolution ("He lost the popular vote by a lot and won the election. We should have a revolution in this country!" which was later deleted) to declaring, "We are not a democracy!" That kind of commentary led NBC's Brian Williams to call Trump out, noting the businessman has now "driven well past the last exit to relevance and veered into something closer to irresponsible." Trump was back at it on Wednesday, firing off a series of tweets aimed at the "Nightly News" anchor. 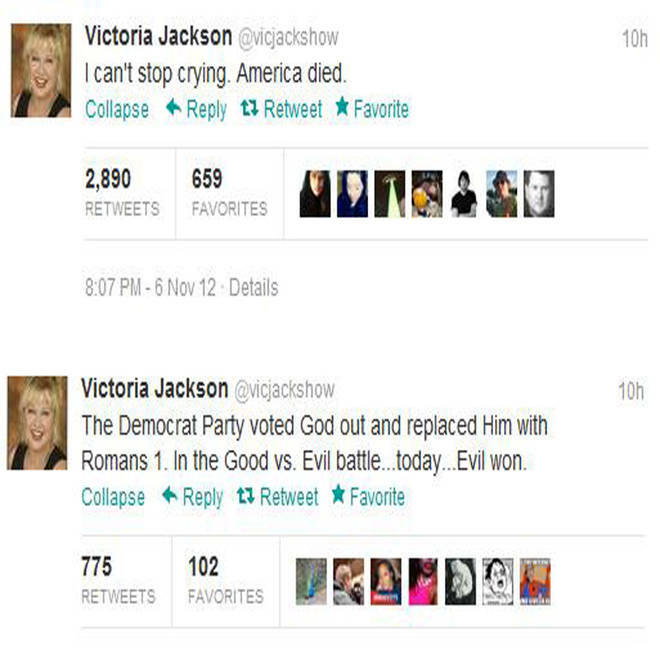 Former "Saturday Night Live" cast member Victoria Jackson also sent through a list of tweets, noting "I can't stop crying" multiple times and that "America died" last night. "Thanks a lot Christians, for not showing up. You disgust me," she tweeted. 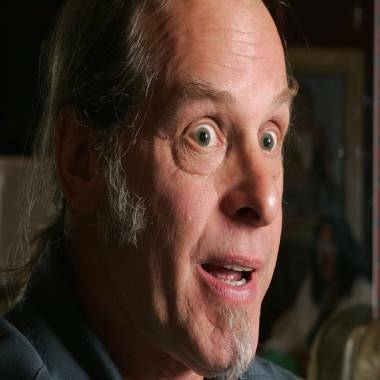 Meanwhile, Ted Nugent kept things blunt, tweeting: "Pimps whores & welfare brats & their soulless supporters hav a president to destroy America." (Typos left as tweeted.) 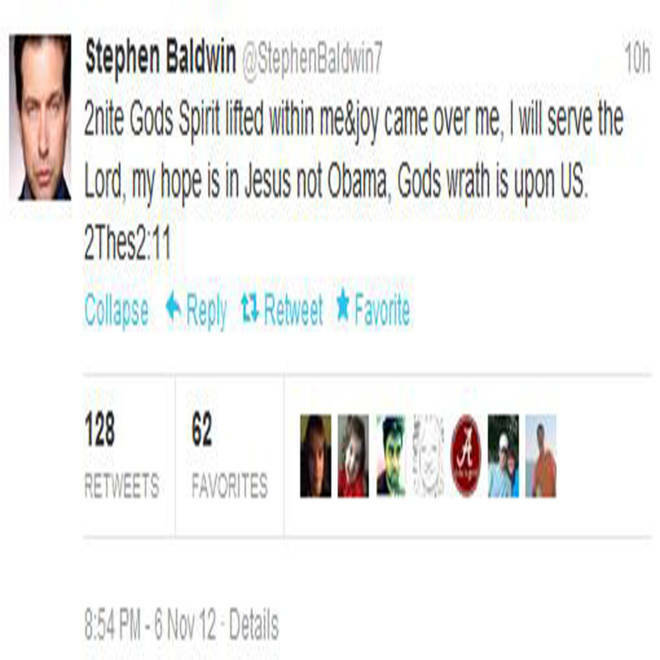 Later, he added, "Goodluk America u just voted for economic & spiritual suicide. Soulless fools"
"The Middle's" Patricia Heaton, however, was disappointed but kept her comments relatively mild. "Bracing for 4 more yrs of high taxes, high unemployment, high debt," she tweeted, adding later, "At least the president can't blame the mess he's 'inheriting' on anyone else but himself!" Still, for anyone who did find last night's results heartening, here's a quick look through some of the top Tweets about not just the election, but ballot issues that dealt with gay marriage and marijuana, among others.